Austin — The Seventh Annual Texas Community Music Festival schedule has been set! This year’s lineup includes 45 musical sets performed by some of the finest community ensembles in Texas. Check the schedule for the complete lineup. 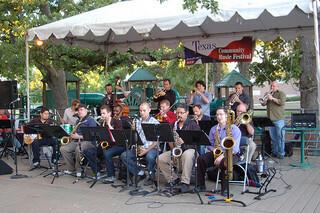 This year’s festival is hosted by Central Market North and the Austin Civic Wind Ensemble and presented by Strait Music. TCMF has long been known for its diverse musical programming and this year is no exception. Music lovers of all ages (that means BRING THE KIDS!) will be treated to everything from classical concert band repertoire to a variety of jazz styles — traditional to modern to big band to swing — to world music to rock to rhythm and blues. And everything and nothing in between. This year’s festival may include the greatest number of newcomers ever! Playing in their first TCMF are Debra Jo Johnson, John Wilson and Friends, Lohman’s Crossing, The Vintage 15, Inside Out Steelband, Bamako Airlines, Dead Music Capital Band (DMC), NUMBERS, Trombonium Sinfonium, The Skylarks, The Austin Symphonic Band and The Blue Diamonds. Go to the schedule page and follow the bands’ links to read more about them. And so many of our TCMF regulars will also be returning. We would be remiss if we didn’t mention the groups who will be playing in their SEVENTH TCMF! That’s every festival since the first! Hats off to The Austin Civic Wind Ensemble, Silver Thistle Pipes and Drums, Chaparral Dixielanders, NAJO, Republic of Texas Big Band, Austin Jazz Workshop and the Austin Polka Band. Our Saturday night headliners will be Mother Falcon on Saturday April 21, and Charanga Cakewalk on Saturday April 29. It will be Mother Falcon’s second appearance at TCMF. So make plans to spend a day, a weekend or a fortnight with some of the most dedicated musicians in Texas and share our love for music! As always, TCMF wishes to express thanks to our hosts, Central Market, the Austin Civic Wind Ensemble and our generous sponsors, H-E-B and Strait Music Company.